Yogyakarta also Jogja or Jogjakarta, formerly Dutch: Djokjakarta/Djocjakarta or Djokja) is a city on the island of Java in Indonesia. It is renowned as a centre of education (Kota Pelajar), classical Javanese fine art and culture such as batik, ballet, drama, music, poetry and puppet shows. You Will be See a nice view in yogyakarta. You Can visit many temple in Yogyakarta. In Malioboro Street, you can walk around to see Yogyakarta. • The Sultan Palace, eventhough it’s no longer the seat of power, it is still the hub of Jogja’s traditional life. • Taman Sari the water castle. This was once a most secret part of Kraton, as it formed a pleasure park of pools and waterways planted with hundreds of flowering trees. • Jalan Malioboro, name of the street that become a iconic of Yogyakarta city. • Beringharjo market, famous as the central of batik, a Javanese traditional cloth, in Yogyakarta. The price offered is also very attractive and can be very cheap. • Drive to Gunung Kidul to visit Goa Pindul. Goa Pindul is a cave formed by karst with underground river becomes well known beacuse of Cave Tubing activity on the cave. Cave Tubing designed that you will float down into the cave. It is a wonder experience come into the mysteriously realm with a cluster of bats and sparkling with the beauty of stalactite and stalagmite formations. • Continue to Bantul and visit Pine Forest in Dlingo Village. Not only pine tree, this forest is also covered by other trees such asmahogany, acacia, walnut and eucalyptus. Now, Mangunan area does not only function as protected forest but also as tourism destination. Aroma of typical pine will be smelled when entering the forest. Rows of pine trees which stand strongly, become the main attraction of this forest. No wonder, if the forest becomes one of favorite spots to make pictures. • Back to hotel in Yogyakarta. • Tour to Kalibiru, one of tourism object in Kulonprogo area, where the main object is natural scenery which also looks like a reservoir that is Sermo dam, by using Jeep participants will be invited to visit the place of the tour. 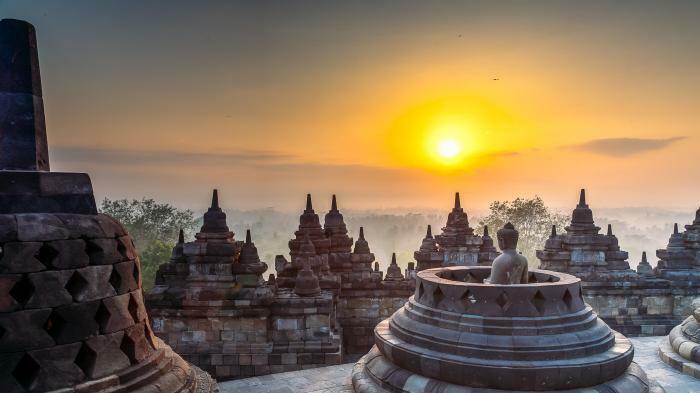 • Then to Magelang and visit Borobudur Temple, an 8th century Buddhist temple and the biggest one ever built until now, was ever been the 7th world of wonders, in this temple is also known as the only one temple that crafting the story of Buddha from his birth until enlighten into Buddha. • Visit Prambanan Temple, one of the largest Hindu temples in south-east Asia. It is characterised by its tall and pointed architecture, typical of Hindu temple architecture and by the 47m high central building inside a large complex of individual temples. Continue to see a sunset in Ratu Boko Temples, is located on a plateau, about three kilometres south of Lara Jonggrang Prambanan temple complex in Yogyakarta Indonesia. • In the afternoon, transfer to airport for your next destination.